Well, ever since OCA and Griffiths Observatory Artist, Chris Butler told us at the OCA general meeting, in the What's UP segment, about Mercury going to be observable just after sunset this month, I was really excited and started preparing my observing plan to finally get an image of Mercury. 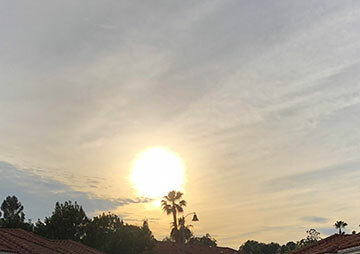 I had previously seen Mercury during the earlier solar transit, as described in the post of May 9, 2016, but had never photographed Mercury itself. Well, the clouds have been so heavy this week, so before talking about the disappointing Mercury saga, let me first mention the news from the last CSULB physics colloquium. The colloquium speaker, Dr. Ana Cadavid, CSU Northridge, told us about how the solar corona is able to reach temperatures of millions K, while the solar surface is a mere 5800 K. It turns out that a lot of energy is transferred by magnetic fields high up into the corona, but the thing that really got my attention was how she told of how these processes were non-stationary, and to analyze them you have to use non-stationary statistics instead of the typical stationary statistics that many of us learned in our college statistics classes. For non-stationary systems, statistical measures like the mean and standard deviation are not constant and change over the course of measurement and you will be taking on too much risk if you use the initial statistics. I asked the professor what other areas of physics deals with non-stationary systems. It turn out there are a lot of other systems that display non-stationary statistics including many systems in geophysics, financial markets and time series have non-stationary statistics. And, oops, duh, the biggest system of all, the Universe, starting with the Big Bang and all of star formation and galaxy formation, is a great example of a non-stationary system and its statistics change over time. I guess I had been so accustomed to working with stable systems in equilibrium that I didn't realize that most real systems have a bit on non-stationary effects. 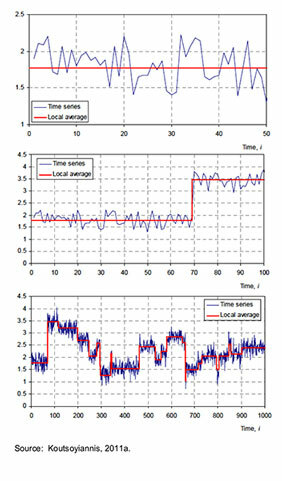 In a separate review of non-stationary systems, consider this example from hydrological systems is shown in this plot of a simulated time series, based on real hydrological systems. Note that if we only had data covering the top panel in the figure, we would probably assume that the statistics are stationary and we would be justified in using the ordinary mean and variance. But if we had access to more data and found the system also went through some change as illustrated in the middle panel, then our old statistics are not valid. Finally, as the system continues to change and the time series from the bottom panel is included in the analysis, well, we have a pretty complex non-stationary system. Ok, enough of time series analysis and let's get back to the saga of trying to take a look at Mercury. Recall, that Mercury is just a little bit behind the sun in its journey and just after sundown, Mercury is still just a bit above the horizon. But, this week has been full of clouds and some rain and even brighter Venus was hidden in clouds. 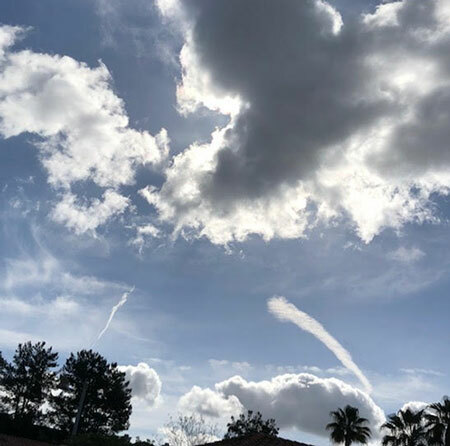 Take a look at the typical afternoon sky in the IPhone photo image below. So, to actually be able to see Mercury, you have to wait for the sun to drop below the horizon. 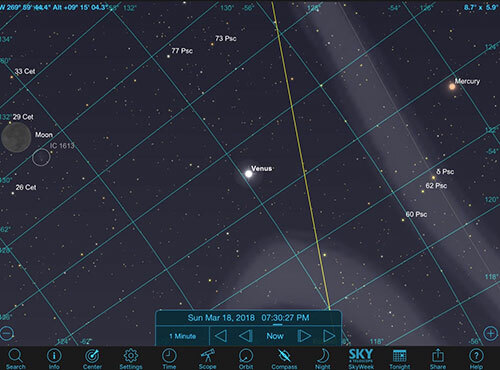 Check out the Sky Safari screenshot below, which shows what a 150mm telephoto field of view lens would show. By 7:30PM the sky is starting to get dark and Mercury should still be about 9 degrees above the horizon. So, there is going to be a race between the time the sun goes down and the time when the sky is dark enough to see Mercury, provided it too hasn't dropped out of your field of view. In order to check if 9 degrees elevation is too low from my easy observing location, check out this IPhone image of the sun which was then located about 9 degrees elevation. Well, there is some leeway and I might be able to still see Mercury when it gets down to about 9 degrees and a bit below that too. But the clouds are going to have to be gone or all this planning will not help. For several days now, the clouds seem to disappear late in the evening, but right at sunset, they just hang around a bit too long. 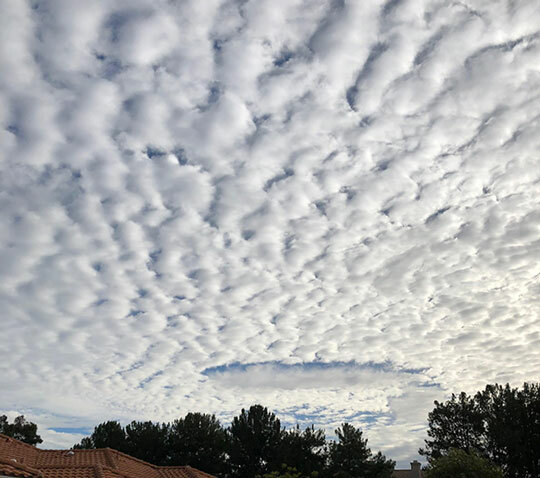 Check out this image of heavy clouds and something in the clouds that reminded me of the scene from the movie "Independence Day." Ok, ok, I don't know what caused that strange image in the clouds, but at least it wasn't ET's. Hey, look, there is a bright object breaking through the clouds. Is it Venus? 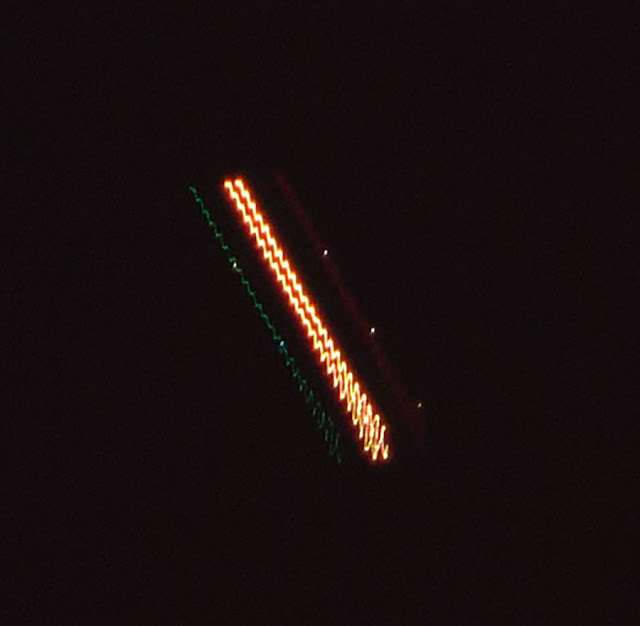 Well, the magnified view of that 150mm telephoto, 4 second exposure, shows it is just an airplane. I am not sure what to make of the strange oscillatory nature of the aircraft landing lights. They sure are bouncing around. The wing strobe lights seem to be pretty well defined without any streaking. 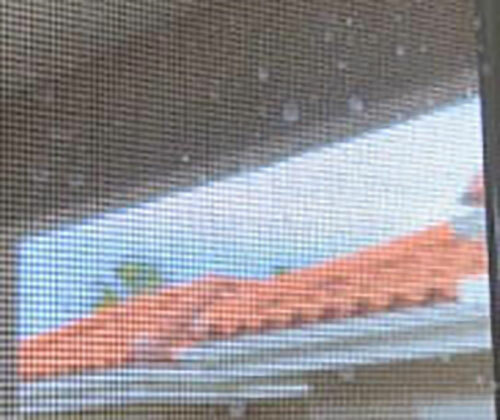 Is the overall effect due to the DSLR shaking or is it aircraft motion as it climbs out of John Wayne Airport? Well, the aircraft is not Venus and this cloudy week has come to an end and we are going to be on travel next week and won't be able to find an opening in the weather to catch a glimpse of Mercury. What to do? 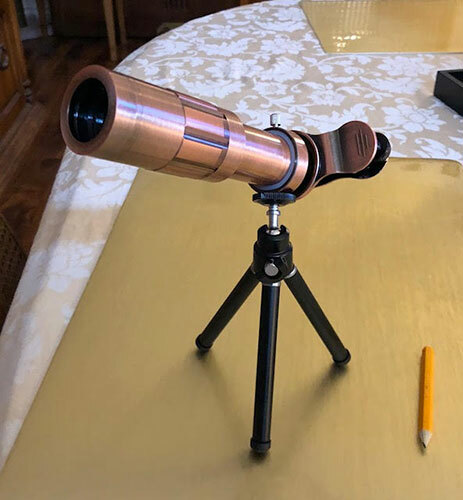 I don't want to carry my DSLR and lens on our trip next week, but decided to try out one of these telephoto lens gadgets that you can just clip to your cell phone and use it to take some magnified, 10x to 20x, images. So, consider the regular cell phone image out the window of some distant trees. 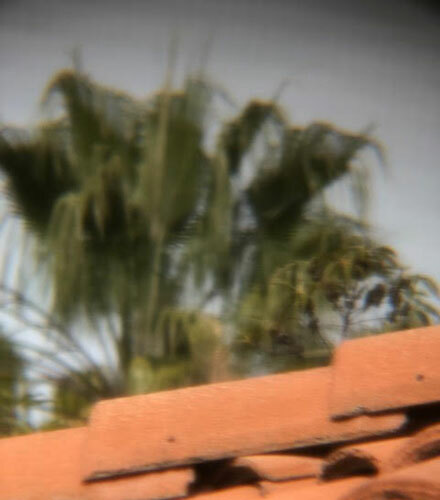 Wow, after a little bit of fudging around, getting the optical axis of the telephoto lens to align with the cell phone camera axis, I got this magnified image of some distant trees across the roof tops. I maybe could get in focus a little bit better. Also, the image blur might be because of my hand motion trying to push the shutter button while at the same time holding the phone and telephoto lens attachment. Maybe, I could use a mini-tripod accessory for this shot as well. 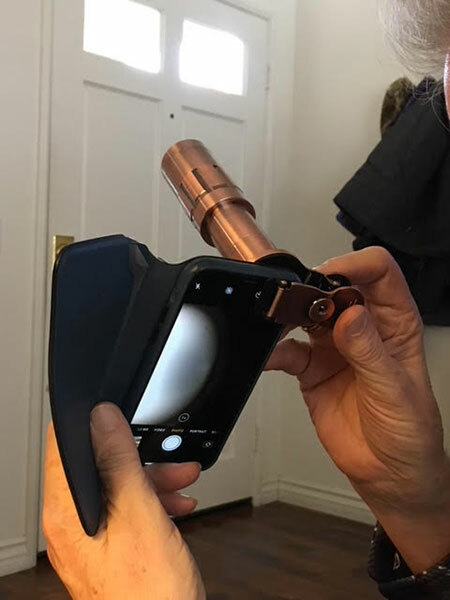 Hey, this little light weight IPhone telephoto lens accessory looks like it might really work out okay. It is more compact than packing a DSLR with its own telephoto lens. It might not have the same shutter speed adjustments, but it is easy to pack. It even comes with a teeny weeny tripod. Pretty neat! I'll pack it in our travel bags for our river cruise on the Douro river, also known as Portugal's River of Gold. It should be fun, but the weather forecast there too is quite cloudy at 30-50% forecasted rain and clouds. Maybe, we will just have to wait to get a photo of Mercury. Anyway, Observatory Staff, Lavonne, who will do all the heavy lifting, and Astronomer Assistant Willow, who will mostly sleep all day and not do any nighttime work either, will be in charge until we return. In the meantime, Resident Astronomer Peggy and I have been busy doing our homework by sampling some 10-year old Port from Portugal! We love doing our homework! We even read a little bit from Rick Steves' travel guide!